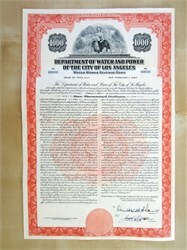 Beautifully engraved RARE SPECIMEN certificate from the Department of Water and Power of the City of Los Angeles dated 1953. This historic document was printed by the Jeffries Banknote Company and has an ornate border around it with a vignette of a well dressed Spanish woman standing in the middle of various natural and industrial scenes. This item has the printed signatures of the Company's President and Secretary. This Spanish pueblo (which officially became Los Angeles in 1850) first relied on the Los Angeles River for its water supply. The river water was channeled through a distribution system of crude dams, water wheels and ditches (or zanjas). It wasn�t until 1860 that the city of Los Angeles� Water Company completed its first water system. 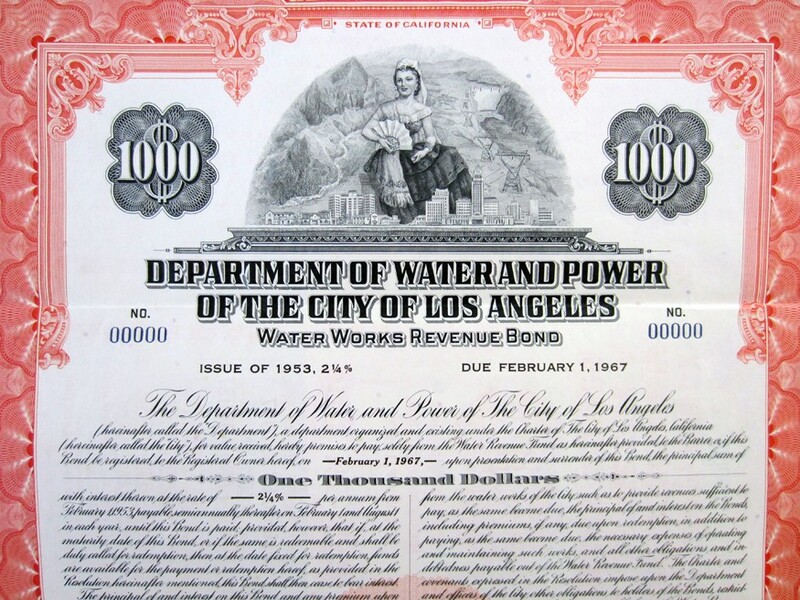 On Feb. 3, 1902, the city formally took ownership of the first Los Angeles municipal water works system. The population of Los Angeles leaped from 5,728 in 1870 to 102,479 by 1900. Along with inherent growth problems, the city faced a serious water shortage. The new municipal Water Department, under the leadership of William Mulholland, its first superintendent and chief engineer, began enlarging the Los Angeles River system. Greater storage capacity was provided to conserve a large portion of the river's flow. Construction of new reservoirs and distribution mains provided added capacity and efficiency for the system. Conservation efforts were initiated at this early date with the installation of meters to discourage wasteful use of water. A man of vision, Mulholland met the challenge of fulfilling the water needs of the thirsty, growing city by looking north. Under direction of then Mayor Fred Eaton, Mulholland conceived of an engineering marvel: a plan to build an aqueduct system that would transport water from the Easter Sierra mountains to Los Angeles, using gravity to keep the water flowing. That plan was met with support by the citizens who, in 1905, voted a bond issue of $1.5 million to purchase Owens Valley lands and water rights. Two years later, voters approved another bond issue of $23 million for construction of a 233-mile long aqueduct. Mulholland's dream was realized in 1913 when water from the Eastern Sierra Nevada came gushing down the cascades into the Los Angeles Basin. As the Los Angeles population grew by leaps and bounds, the Department built a 177-mile second aqueduct from the Owens Valley, completed in 1970, which had capacity to bring an additional annual flow of 152,000 acre-feet to Los Angeles. The Los Angeles Aqueduct did more than supply water to the city. It also brought power to Los Angeles. During the building of the aqueduct, the Department brought online the city�s first power plant�located at Division Creek and built in 1905�to supply hydroelectric power for the aqueduct�s construction. The Bureau of Los Angeles Aqueduct Power (forerunner to the Department of Water and Power) was established in 1909, with Ezra F. Scattergood named as chief electrical engineering. As Mulholland's counterpart for the Power System, Scattergood became the driving spirit in the development of the municipal electric system. As Los Angeles grew, the Department of Water and Power continued to face the challenges of providing sufficient water and electricity to the booming city. The Department built San Francisquito Power Plant 1, north of Los Angeles, in 1917, marking its first step in becoming an independent electricity provider. The LADWP continued to acquire smaller electric companies, and by 1939, was the sole provider of electricity for Los Angeles. As more people moved to Los Angeles, LADWP joined partnerships to bring power from Boulder Dam (now Hoover Dam). A 266-mile transmission line was erected from the dam to downtown Los Angeles. It was the first time the Department ventured out of state to bring power, and set a precedent to join consortiums to build power plants in Utah, Arizona and Nevada. After World War II, the city�s population grew to 2 million people, and with it, so did the Department�s power base. In the 1950s and 1960s, the Department added a number of power plants, including the Owens River Gorge Hydro electric Project, Valley Generating Station, Scattergood Generating Station, and Haynes Generation Station to accommodate power needs. Since 1970 and into the 1990s, the LADWP has focused on reliability, ensuring a smooth power supply by diversifying its energy portfolio. The Department also began advocating the feasibility of using renewable resources and alternative energy. For instance, LADWP launched pioneering efforts to promote solar energy and clean, hydrogen fuel cell power generation.